The Action Man horse I bought recently arrived in a rather large box. The paper bins are full at the moment, so the box is still languishing on the floor of the games room. So of course the cats had to climb in. It's currently their favoured place to sleep in the games room, and I suspect they will sulk when I do throw it out. Skiffle isn't too keen on sharing though, and if Diesel gets in with her, Skiffle will be out in the next few minutes. 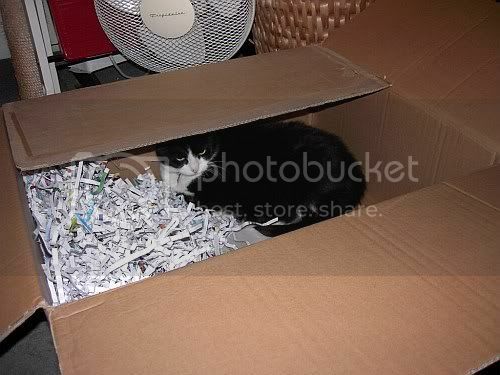 Kittehs in boxes is teh funny. ICanHasCheezburger confirms it. 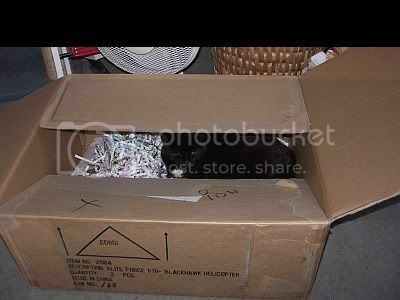 But is kitteh in box alife or ded? Does n e one no? Better ask dat Shrow... Shoe... dat physicz hoomin.